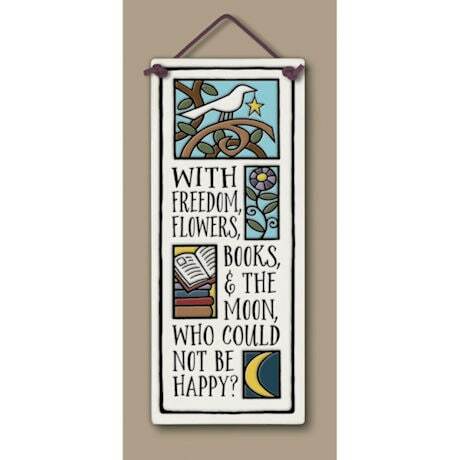 Happiness often lies in things we take for granted: freedom, flowers, books, the moon up above. Crafted by hand in the studio of Shell Lake, Wisconsin, potter Michael Macone in the tradition of American art pottery, plaque is etched, hand-glazed, and kiln-fired twice. Fade-proof and weather-resistant, it comes on a sturdy hanging cord. About 4" x 9". Made in USA.